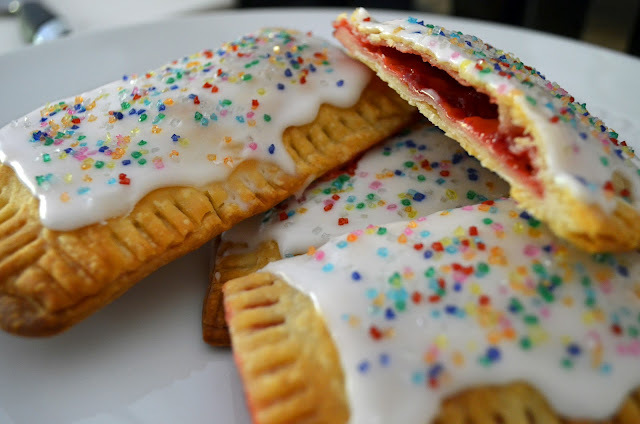 Friday, I made pop-tarts. And I don't mean I pulled that little silver packet out of a box and popped two tarts into the toaster kind of thing. I mean I made pop-tarts. From scratch. My single greatest baking accomplishment thus far...and it was stupid easy. Of course, I did pick the hottest day of the year here in Germany to take on this pop-tart endeavor. It was just about 90 degrees outside, which means it was probably like 95 in my A/C-less kitchen with the oven cranked on high. Probably not the smartest thing I've ever done, but the tarts were calling my name. And when pop-tarts call, you just answer. The trip to the ER for heat stroke would have been totally worth it. I didn't really grow up eating pop-tarts. I grew up eating doughnuts...Krispy Kremes to be exact. You see, my dad has been an engineer of sorts at Krispy Kreme for over 30 years, so doughnuts were always plentiful in our home...and I've got the thighs to show for them. But pop-tarts, eh, weren't a big deal. Until I got to college, at least. Then I couldn't keep my hands off those yummy brown sugar cinnamon ones. They made them in reduced-fat, too. It was a done deal. Grab a tart and off to class I'd go. That's not a good thing seeing as I was getting my degree in Nutrition & Wellness and pop-tarts are like the least nutritionally dense food on the planet. What an example I was setting...so, I ended up going cold turkey and haven't touched a pop-tart in almost 4 years. Well, I lie. I ate one around Thanksgiving. Mom shipped us a care package filled with Fall goodies, including Pumpkin Pie Pop-Tarts. Umm, amazing. They were gone in like 3 days. But I've gone cold turkey since then. Promise. When I saw these babies floating around on Pinterest (a.k.a CRACK), my pop-tart juices started flowing again. I'm all about cutting out preservatives and making as much of our meals from scratch as possible, so this was almost a no-brainer. I could get my pop tart fix using my own ingredients without having to eat all that added stuff you can't pronounce on the nutrition label. I also cut out some of the sugar and fat calories by using sugar-free jam and light butter. Boom. Fresh, homemade, (ahem...reduced-fat) pop-tarts. I'll be waiting for my Nobel Peace Prize. These things could stop wars. 1-2 Tbsp. of your favorite sugar-free jam (I used Smucker's Sugar-Free Strawberry Preserves...if you have homemade jam, even better! It won't be sugar-free, but at least you know what's in it! I have no jam making talent, so it was the jarred stuff for me.) Spread the filling onto the dough rectangle, leaving a 1/4" boarder around the edge for sealing the dough pieces together. Take the end of a fork and crimp the edges for a decorative seal. Place tarts on a lightly greased or parchment-lined baking sheet. Prick the tarts a few times with a fork to allow the steam to escape and bake them for 10-13 minutes until golden brown. 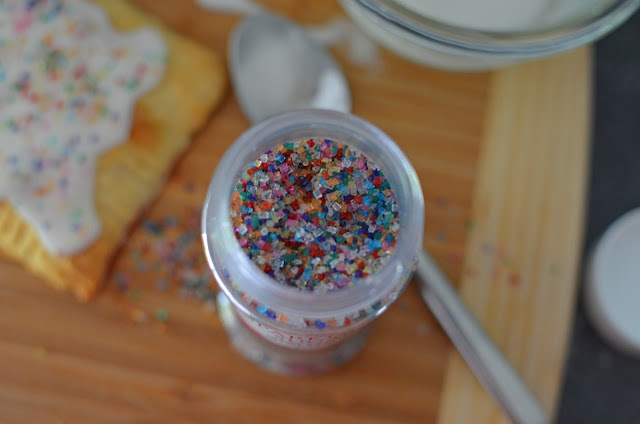 Top them off with a pop of color from your favorite sprinkles or go icing-less...but who'd ever want to do that? Seriously guys, go try these babies. It'll take you back to being 8 years old in a heartbeat...and I'd bet money you'll never open one of those silver packets again. I LOVE me some Poptarts... I've eaten them for breakfast since I was in Kindergarten! I've been trying to eat some "healthier" breakfast options lately, but I will DEFINITELY be giving these a try! They look amazing! I'm making these with Nutella in them... How yummy would that be????? Thanks for the idea!! 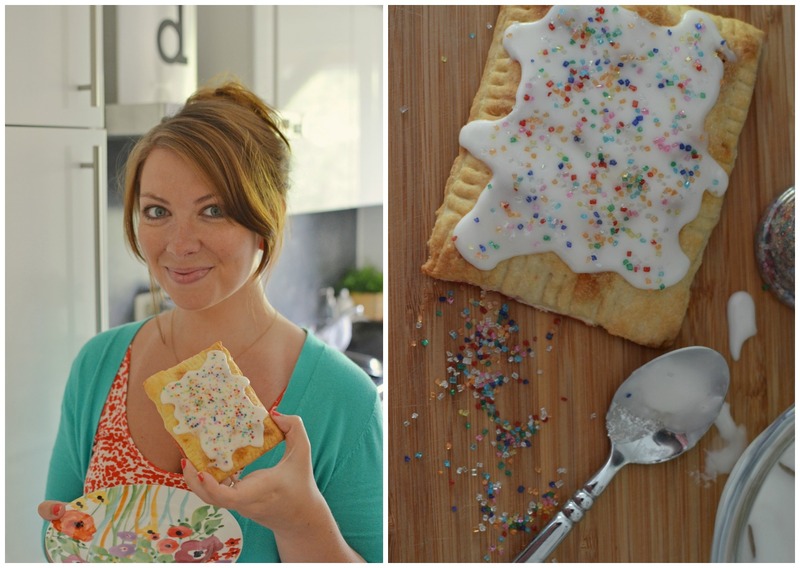 I am not a huge pop-tart lover - but those look fantastic!! I love baking and everything to do with breakfast... as soon as the temperature drops below 100 I think I'll try those! These look amazing! 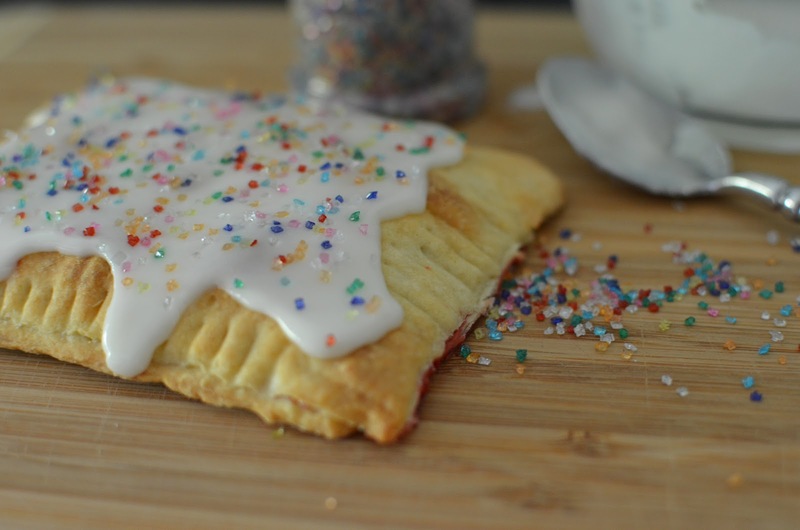 There's a place where I Live that makes homemade pop tarts. It's impossible for me to pass by without stopping in for one. Thanks for the recipe! you do realize that i'll be making these asap.. .right? i mean seriously, you are a GENIUS! Look at you! They're perfect. Seriously! I came across this recipe in one of my magazines last month and haven't gotten around to making them yet. I won't let our kiddos eat the grocery store version, so these would be perfect!!! Great photos! Yum! They're so pretty, and I'm sure homemade tastes way better than the store-bought varieties. Also? The pumpkin pie Pop-Tarts are to die for! I need to scarf up several boxes when they next hit shelves . . . they're amazing, and really hard to find! How fun! I tell ya...that Pinterest gets us into all kinds of trouble, doesn't it?! Looks like yours came out great! ---- Read your guest post about what you learned in your 20s too, and it was just wonderful! Thanks for sharing all that wisdom :-) Hope your day is going well so far Casey! Yum! I wanna try this! This is brilliant. 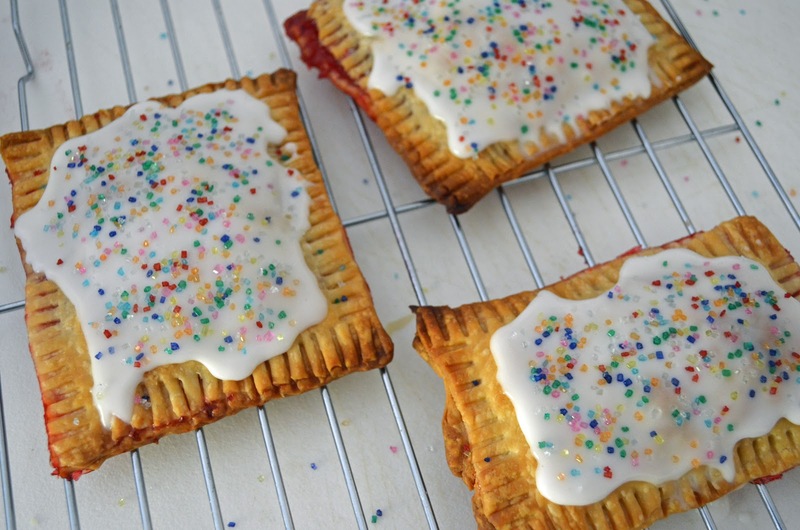 Ive never thought to make these and I lovve pop tarts, though I too swear them off. I want one so badly right now!! These look amazing and I love the name of your blog. I'm your newest follower from The Things We Find Inside. I'd love for you to check out my blog. These look disgusting! Oh wait I'm lying. They look so dang good! I'm trying to trick my brain into not wanting to make these (it's not working)! Yummmmmmy! I honestly think I've had maybe one poptart my whole life. Maybe I am missing out? haha! But I must say these DO look delicious! I've seen these on Pinterest and was wondering if they were any good...might just have to try them! This looks AWESOME! I'll definitely have to try! I'm like a week late for seeing this, but oh em gee they look delicious! 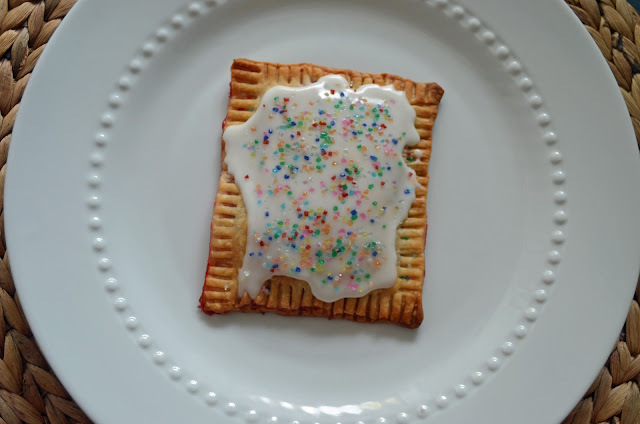 I never really had pop-tarts growing up, so when I do have one I feel like I'm always having a super special treat. I may need to make some...once fall comes around and I can walk into my kitchen again :) Pinning this for later! Just found your blog and this is my first post to read. My 14 year old son is obsessed with pop tarts but I refuse to buy them for their lack of nutrition. So excited to find this recipe. Plan on making them tomorrow! This looks fantastic and like you said, easy! I know a lot of people I could make these with for a fun afternoon treat. Thank you for linking to Wonderful Food Wednesday. Looking forward to following you and enjoying more of your blog. These look great! I'm pinning! Thanks for joining the party at Keep Calm and Link Up this week! Can't wait to see what you link up next Friday! Dude. Jam is SO easy. You can do it. 3 ingredients: fruit, lemon juice, sugar. You could DEFINITELY do that! Great post. I was looking up Tuscan Villa rentals for my next vacation when I came across your post. I am glad I did because I never even thought to make my own pop tarts. They have to taste so much better than the store bought ones. Thanks so much for the recipe, I can't wait to try these.